About this post. This is one of several posts (overview) sharing R|CAT’s afternoons of in real time blogging about certifying entities and their certification criteria. 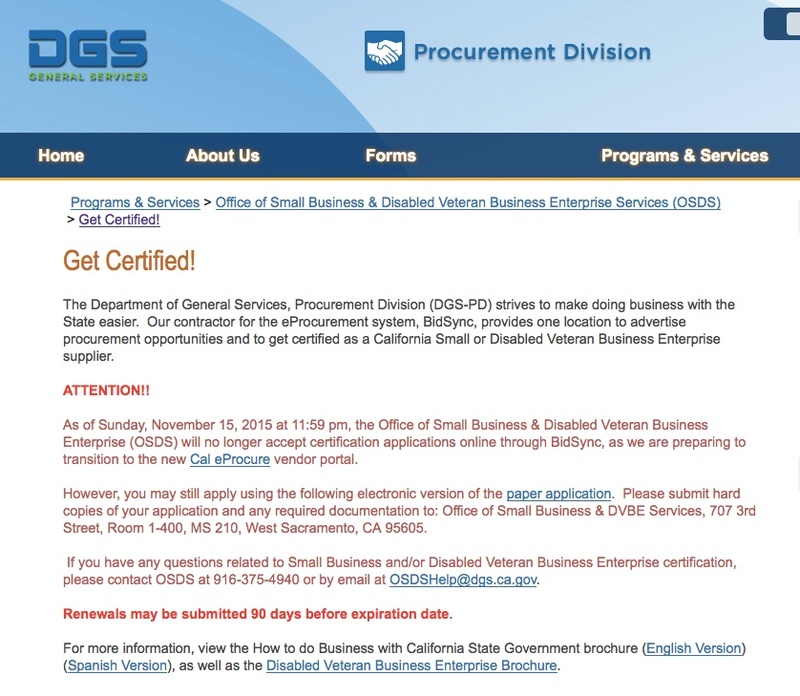 This post presents initial activities for formally beginning (on 17 November) the Department of General Services or DGS (California-based) certification process for its Office of Small Business & Disabled Veteran Business Enterprise (OSDS). Because an on-line application process is not currently available, this is a cursory review of the required information, compared to The Supplier Clearinghouse information requirements. Bottom line. Applying is free. There is no longer a current on-line application process until the on-line process transitions to a California-wide procurment portal. Until DGS’s application process is available on Cal eProcure, an electronic version of the paper application (.pdf) is available. Much of the required information also is part of The Supplier Clearinghouse Fast Track Process application (.pdf). A different business classification code (UNSPSC, United Nations Standard Products and Services Codes) than SIC or NAICS is used. The Department of General Services (or DGS) will have an on-line application process in December 2015. 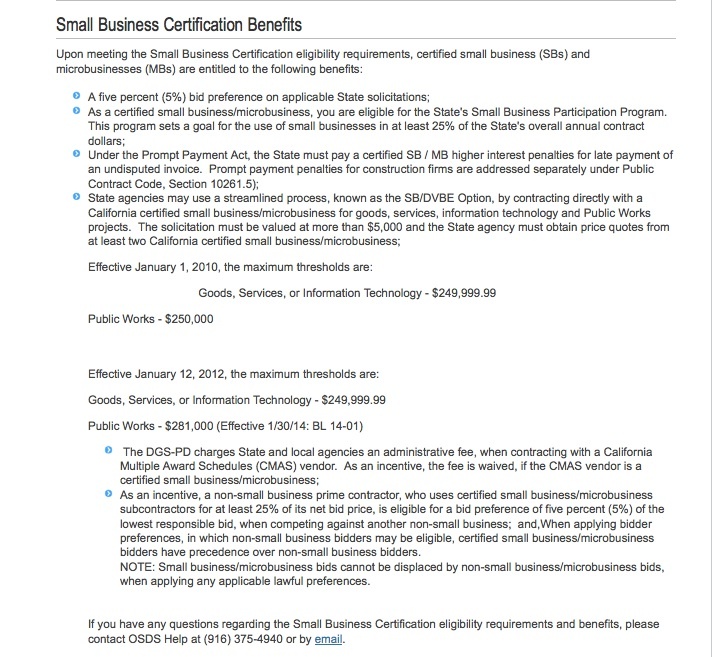 R|CAT certification under this agency would be for Small Business Certification. For now, an electronic version of the paper application (.pdf) is available. Surprised to see this ATTENTION!, this afternoon’s session to begin the on-line DGS certification process is short-lived. 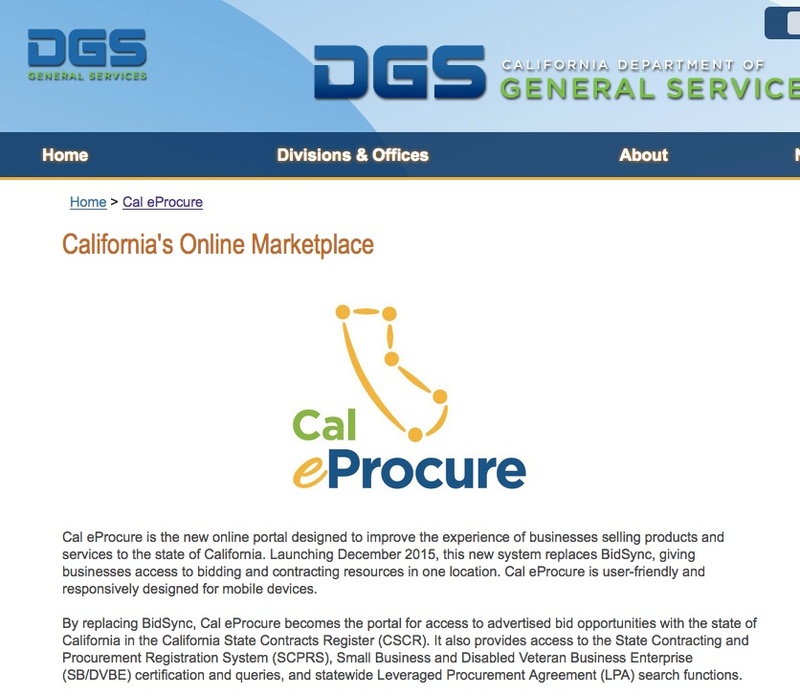 Cal eProcure is the new online portal designed to improve the experience of businesses selling products and services to the state of California. Launching December 2015, this new system replaces BidSync, giving businesses access to bidding and contracting resources in one location. Cal eProcure is user-friendly and responsively designed for mobile devices. By replacing BidSync, Cal eProcure becomes the portal for access to advertised bid opportunities with the state of California in the California State Contracts Register (CSCR). It also provides access to the State Contracting and Procurement Registration System (SCPRS), Small Business and Disabled Veteran Business Enterprise (SB/DVBE) certification and queries, and statewide Leveraged Procurement Agreement (LPA) search functions. As an incentive, a non-small business prime contractor, who uses certified small business/microbusiness subcontractors for at least 25% of its net bid price, is eligible for a bid preference of five percent (5%) of the lowest responsible bid, when competing against another non-small business; and When applying bidder preferences, in which non-small business bidders may be eligible, certified small business/microbusiness bidders have precedence over non-small business bidders. All this means is that there are goals of applying certain contract dollars to certified small businesses. The following is a quick review of the paper application (.pdf) to identify information required, in addition to what has been gathered for the Clearinghouse application. DGS also has a list of required documents. This will be addressed in a separate post. For the DGS Small Business Certification process, what tips do you have for completing the process?